Born of fire in the Grand Canyon State under a big sky where the saguaro flowers bloom, Nicholas and Christopher Kunz grew up cradled by Mother Nature’s promise. The Rocky Mountains were their skyline and their imaginations were fed by the changing seasons and the colors that they wrought. With a Chinese-Russian mother and a German-Irish father, the duo garnered an early understanding for difference and how it would sow its seeds deep into their roots. Founded in 2003, the namesake designer has opened NYFW for the past 10 seasons with collections that chase fluidity and strive for continuity, quality and honesty with neutral colors and functional silhouettes. Nicholas K has done nothing that you wouldn’t expect them to. Asking you to leave your desires for the avant-garde at the door, they humbly implore you to embrace the “unconscious sustainability” and pure intentions that they have for the future of fashion whilst in an era where some silently scream, “fashion is dead, long live fashion”. Entering their SoHo studio on a brisk but sunny October morning, I was greeted first by the myriad of plants sitting in their gaping windows and then by their boxer, Barbosa, who they rescued from Puerto Rico. Nicholas swears that he’s actually the reincarnation of their last boxer Jake, saying that the dates all line up and I believe her. The fact that her eyes are kind, large and a deep brown, helps. She wears an ornate turquoise necklace suited for Native American royalty conjuring up images of the Wild West that she knows to be home. Her left arm bears a matching cuff. I shake Christopher’s hand next. His grasp is firm but kind. Eye contact with him is easy, like staring into a slow-burning fire. They both dress in black and I can’t help but to fawn over Nicholas’ Margiela Tabi boots before we sit down in the foyer area of their studio where a sandalwood candle burns below a blooming, white orchid plant. You are struck by color the minute you decide to shop Nicholas K. Metallic golds fade into dusty sand-colored hues before folding into greys, blacks and auburn reds that appear as if they’ve been licked by tiny fires of the mind. While color bears a certain brilliancy, the silhouettes of items like the Marco hoody (named after Nicholas’ husband, Marco, who does the brand’s creative digital photography) or the Field Pants display a certain astuteness that mark Nicholas K garments with a formidable timelessness. “We’ve been doing streetwear kind of from the beginning because what we believe in is comfortable and rooted in function. People would always try to give us advice, saying, ‘you need to use dressier materials, you need to be more pretty, more floral’, and there was a point that we were like, gosh, do we need to do that to be more successful? So you listen to people and you do this loop but the whole point of art and design is not to follow a certain formula, the whole formula is to make your own formula and create your own aesthetic, that’s the hardest part,” said Nicholas while stroking Barbosa’s head as he lay gazing up at her. Yet finding this balance was like waiting for the tide to rise before setting sail. With a team of creatives that knows their individual strengths and weaknesses, the biggest challenge for the team at Nicholas K was not a differentiation of roles but instead being a part of the industry itself. “Fashion had this formula for so long on how you had to do business, how you have to deliver what’s on trend how many times a year and things like that. That was always problematic for us because we didn’t feel like we cared when people would tell us that lace was on trend it was like okay, fine. We think about who our customer is and what they want to wear and how we can develop pieces that five years from now, they could pull out and find relevant,” explained Christopher. Yet this sensibility might often be too easily mistaken for a bold-faced humdrum when placed besides ideas of newness and nowness. While collections might look “the same,” nuances are found in the fineness of detail, when one can take a step back and look at the entirety of the brand’s narrative. For example, for its SS18 collection, the team chose to release their Azulik Collection on Instagram instead of on the runway because they felt that genuineness was lost amidst paid appearances by those in the front row and the ever-ascending drama of performance detracted attention from the clothes. “There were like two reviews that didn’t even mention if they thought the evolution of the collection was great or not, it was about the show, how long they waited, who was sitting front row. It was like what is fashion about now?” questioned Nicholas with a tinged breathiness. There is no answer to that question, at least not a universal one. For Nicholas K though it’s wrapped up between higher ecological standards, industry transparency and the further exploration of their own identities. Turning first to their roots and the natural world that has colored their collections and philosophies, Nicholas K is pioneering a movement for intention. That intention is rooted in sustainable and eco-friendly practices and has been noticed even by the likes of the CFDA as they are currently participating in the CFDA + Lexus Eco Initiative. The brand tries to use organic materials whenever possible, (ideally it would be 100% of the time but there are limitations, issues and a lack of resources, along with the fact that many of these certifications aren’t uniform across companies) often experimenting with vegetable dyes and alpaca wool and collaborating with artisans to make their collections come to life whilst giving life. They have said, “no one can afford cheap things” when the fate of the planet and the wellbeing of future generations is at stake. While companies like Zara and Forever21 continue to dish out $5 tanks and $9.99 sweaters, the cold hard facts become important, if not glaring. Second only to the agriculture industry, the textile industry is the leading polluter of water. With environmental and ethical ramifications that are too easy to turn a blind eye to, the fashion industry today needs to look itself in the mirror and admit that true artistry and creation should not come at the expense of our planet. “As we did more deep diving into the certifications for the CFDA process, we were confused by all the different standards and we started thinking, gosh, we’re overwhelmed by it, what does the consumer think? As an industry, that’s one of the things that we need to solve, highlighting for people the differences between different fabrics, people don’t understand the difference between synthetics and natural materials,” stressed Chris. The synthetic fabrics that he references are oil-based materials and the demand for them has grown exponentially from 5.2 million tons to 67 million tons in 2016 alone. If you ask Nicholas or Chris especially, if they’re a “fashion company,” they’ll kind of shrug their shoulders, suggesting that they’re more so a company rooted in style. With an impartial look at the world of retail, they often opt for trunk shows. They wear the clothes they design and seek to foster a work environment that feels like family, because it is (well, besides the whole brother-sister thing). What makes them happy are customers who want videos on how to style products like the Serius Sweater and those who call in for phone orders because knowing how to use the internet still evades them. “The biggest lesson for me was staying true to yourself and knowing that you don’t have to be a mean person to work in fashion. The industry is not dead, it’s evolving into something else and no one knows where it’s going to land,” said Nicholas calmly. But does where it lands even matter? As I scan their faces, lingering tenderly on Barbosa’s, I find my answer in the backs of their gazes: no, it doesn’t. The genuine joy that Nicholas and Christopher feel when they come to work is dependent on their authenticity to themselves as designers, yes, but more so as individuals. 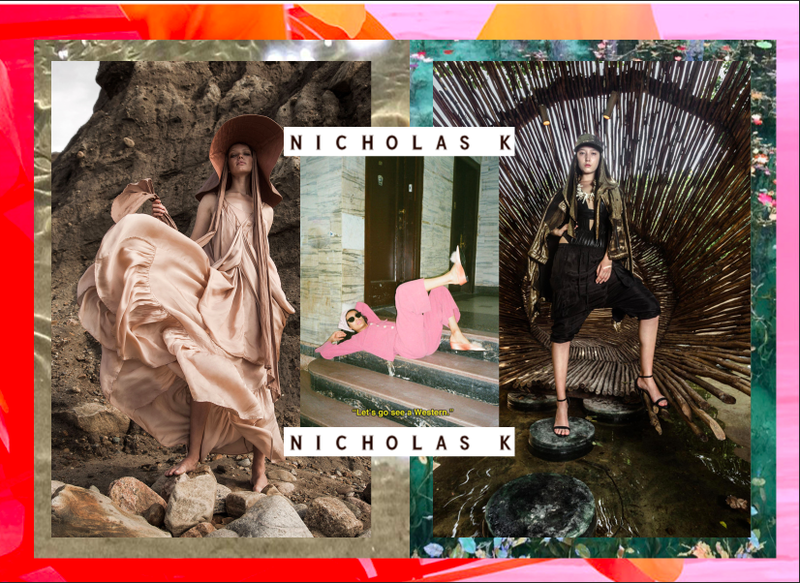 As fashion and its subsidiaries shake in this season’s neon-colored, thigh-high, stiletto boots, deliberating trend reports and scouring Instagram for new muses, Nicholas K chooses to spread its wings and head North for the winter.